I first read this book about 7 or 8 years ago, while living in Oxford and actively working as a scout leader. I borrowed it from a fellow leader and sniggered and giggled through the evening, night and into the following morning, until I had finished it. It is the story of a man and his borrowed dog, Boogie, when walking the coastal path from Minehead to Poole. Having 'always meant to' Mark Wallington graduates into 'actually going and doing' the entire path. This is despite his friends' amusement, his complete lack of equipment and a travelling companion. All of which he borrows (including the very reluctant and Town-minded Boogie). It is a very sharp insight into one man's slant on the West country, the seaside, dogs, people and camping equipment. and back to me. Enjoy. Received this today from Scaree, I'm first in the bookring, so I'll try and read this before I leave for teh UK this week, and then bring it with me to post onto the next person! Really enjoyed re-reading this book, will add more thoughts on this later on, not when I'm in an internet cafe! I so enjoyed re-reading this; it felt like just yesterday that I last read it! Wallington's style of writing is so infectious and good humoured and just generally wonderful. The dog Boogies (and his flatulence!) rather steal the slow, but the comic act between man and his dog is very entertaining. Like Scaree, I too sniggered and laughed my way through it, to the chargrin of the passenger next to me on my flight from Zurich to London - sorry! I'd forgotten how long ago this book was written - 1983 - his reports on the Argentinian conflict really jumped out at me. Bizarrely, just re-read Adrian Mole which is from the same period. Thanks Scaree for this read, much appreciated! Arrived today - thanks a lot. I've just bought Mark's second book which I came across, just be chance, in a charity shop yesterday. 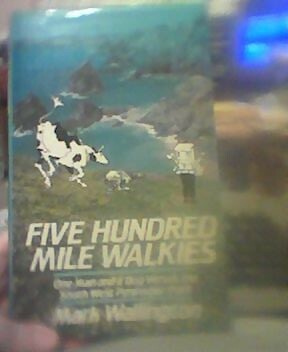 It's called "Pennine Way" and I plan to read it as soon as possible (if I get a break in the rings and rays hitting me at the moment!) and then will put it up for a ray as well. So watch the BCUK space if you want to read more of this stuff! Arrived last week while I was away (and ironically in need of reading material!) - thanks scaree and coolboxuk :) Will read and journal again before very long. Needing some light reading after being away on a conference, I wolfed down this book much as its canine hero Boogie would have wolfed down a proffered crisp or biscuit. I just couldn't put it down and at one stage had to force myself to go and cook some tea! I loved the wry self-observation, the little repeated jokes, and the overall sense of an average bloke and an average dog doing a not very average amount of walking but making it sound achievable. It really made me want to do something similar (oh for the time!). Fabulous. Thanks for the chance to read it! This arrived today. I'm halfway through a (medium) book, so hopefully I'll be starting this on Monday. I’ve lived in Plymouth for eight years now, and have extensively explored Devon and, in particular, Cornwall. It was therefore so lovely to follow Wallington’s journey around a coastal path that is very familiar in many areas to me. I enjoyed the humour and the wry observations, and feel *almost* inspired enough to attempt a similar trek myself! Thank you for including me in this ring; this little breath of fresh air. I’ve got TutleyMutley’s address and hope to head to the post office this lunchtime. Like Mytilus, I've lived in the South West for many years (off and on - I wuz born down yer), so i was interested to find out what Mark Wallington's take would be - unfortunateley he seems to have encountered dense FOG when he reached my local area! He made me laugh out loud in many places - and certainly made the hike seem achievable, because he was so remarkably unprepared for self sufficiency - I don't think he'd been studying any Ray Mears stuff, or belonged to the boy scouts. There was one scene straight off the Fast Show - the competitive Dad playing cricket with his son on the beach somewhere near Start Point - did Mark Wallington write sketches for them? Boogie's metamorphoses from cool city slicker dog to country bumpkin rabbit killer was what made the tale in my book. In the meantime - thinks must dig out my tent and how much of the Coastal Path could I fit in, on a weekend off? Safely received from the intrepid TutleyMutley and returned to my bookshelves. If anyone would like to read it, I'll be considering a new ring next year. BookcrossingUK Yahoo list. I'm more likely to receive it or be prodded into action.